Zoya Nail Polish* is pleased to announce our New York Fashion Week – Fall/Winter 16 Sponsorships. Follow us online @ZoyaNailPolish (everywhere) for all of the latest backstage beauty and nail polish fashion news. 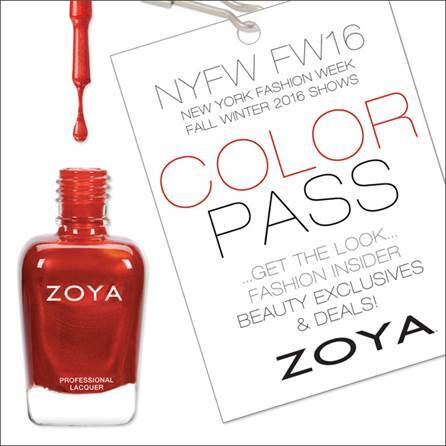 …and make sure to get your ZOYA NYFW AW16 Color Pass for Full Access! Join ZOYA at New York Fashion Week. Get your NYFW Color Pass to gain instant access to exclusive deals & trios throughout NYFW AW16. It’s FREE, easy and you’ll receive your very own unique code to use on any (or all!) of the NYFW trios. CLICK HERE TO VISIT OUR COLOR PASS PAGE! Add the pass to your bag, (item will show as free) and checkout – no payment information is necessary! Shortly after you’ve checkout you will receive an e-mail with your unique code – please allow up to 10-15 minutes for the e-mail to be delivered. If for some reason you do not receive an e-mail within this time frame, you can access this code by logging into your account at zoya.com, clicking the ‘My Account’ button at the top of the screen and then select “Promo Codes” from the menu below. Follow the ZOYA NYFW PAGE HERE to see the specially curated trios once they’re revealed after each show ZOYA is sponsoring for NYFW! **BIG5FREE: Zoya Nail Polish contains no formaldehyde, formaldehyde resin, dibutyl phthalate, toluene or camphor.